We spent two days cycling along the western edge of Macedonia, a brief interlude before heading back to Albania and toward Montenegro. A stream of hotels still closed for the winter reminded us that we were ahead of the busy summer season on Lake Ohrid. 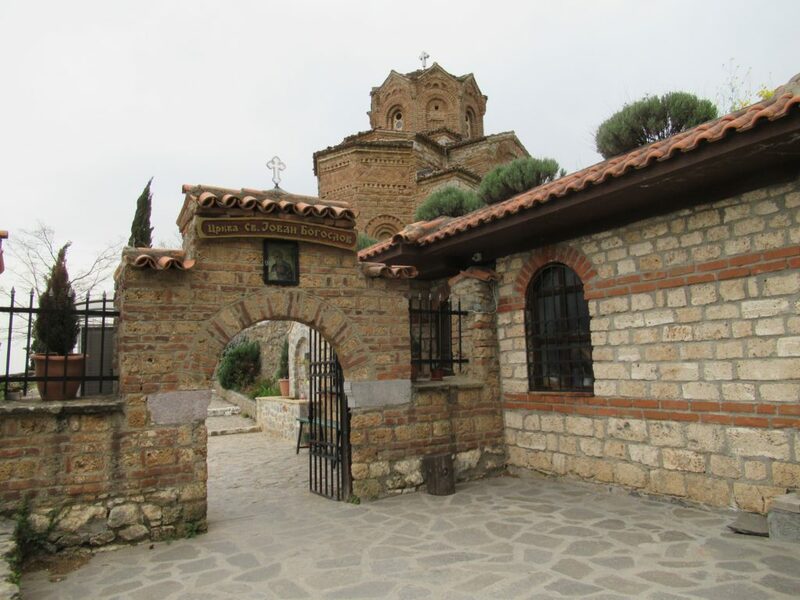 Ohrid is deserving of its natural and cultural World Heritage Site designation; the lake is one of the deepest and oldest in Europe, while the city boasts an impressive number of medieval churches, traditional buildings, and ruins in a labyrinth like downtown core. 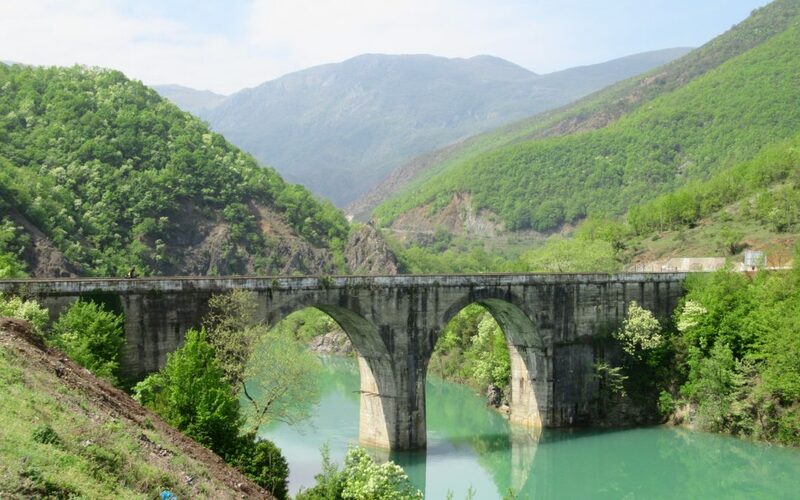 We followed the winding Black Drin River as it descended to the city of Debar. Views of alpine towns across the water nestled under snow-capped mountains reminded us of Switzerland but without the tourists. 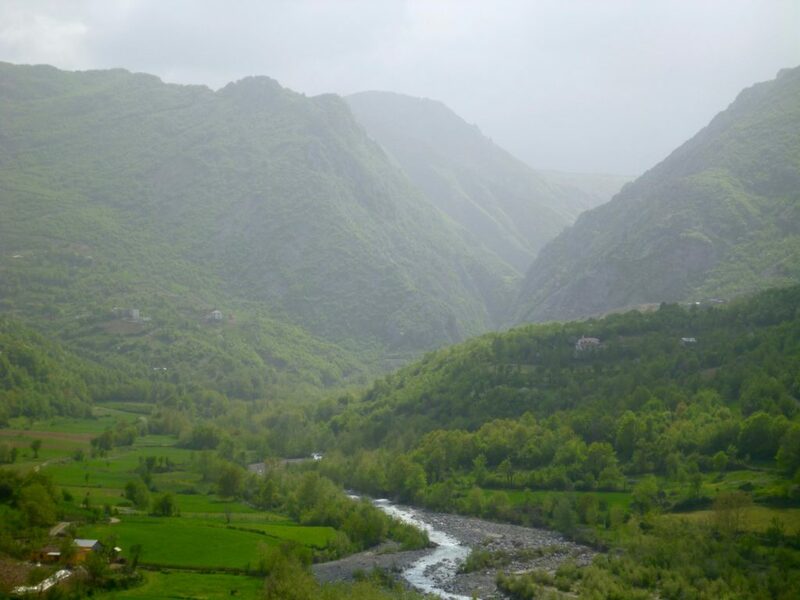 From Debar we headed northwest and back into Albania with steel gray clouds closing in behind us. We stayed just ahead of the impending storm all afternoon until it finally broke once we found shelter in the small city of Burrel. Finding groceries while cycle touring can be a frustration and a thrill. The discovery of new flavours and foods is tempered by limited selection in many areas, especially in the small towns of Albania. Navigating a new grocery store every day is also a time consuming process. Although we found most Albanians to be exceptionally friendly, we were dismayed to find a number of shopkeepers attempting to swindle us. A bottle of water and a loaf of bread that sells for 80 Lek was offered to us for 800 Lek ($1 vs $10 Canadian). As I waited for Heather to find bread in one town for a fair price, a local villager stopped me. “Why do you visit Albania” he asked. I spoke of the scenic beauty and lack of tourists. “Sure, scenery is nice, but no money, no jobs, and government is corrupt” was his response. It was a sobering reminder of the challenges of living in Albania, and our very narrow view into it as travellers. Our route through the northwestern part of the country was stunning. Rainforest-like mountains carpeted the landscape to the west while we snaked our way through a riverside gorge. After over a week of riding through incredible inland mountain ranges, we met up with the mighty Lumi Mat river and found ourselves in the coastal flats of Albania. Cycling on quiet flat roads to just before the border of Montenegro was a relaxing change of pace from the challenging seesaw route we had just completed. But the hard work had its rewards; tremendous views, off the beaten path (quite literally) spots, and a small taste of life in this corner of the Balkans.